(above) Second and final state. Copy after J.M.W. Turner from a reproduction of the watercolor The Burning of the Houses of Parliament, from Old Palace Yard, with Westminster Abbey, watercolor and graphite on Arches paper in bound volume. As I stood in front of J.M.W. Turner’s watercolors at the recent National Gallery of Art exhibition, it seemed to me that he basically relies on yellow, red, and blue. These primary colors are organized into zones: yellow for light sources, red for land and figures, and blue for skies and water. Details within these areas are generally layered light to dark, starting with yellows, adding reds, and finishing with blues. By overlapping these few colors the artist can create any nuance of hue that is needed. Light penetrates the transparent color, bounces off the underlying paper support and back into the viewer’s eyes. Think of the brilliance of stained glass as opposed to light off a painted wall. Turner’s message is clear – retain transparency in color and the light remains crystalline. “Light is the lion that comes down to drink”, said Wallace Stevens. Turner offers a luminous pool. Link to Wallace Stevens poem, The Glass of Water. 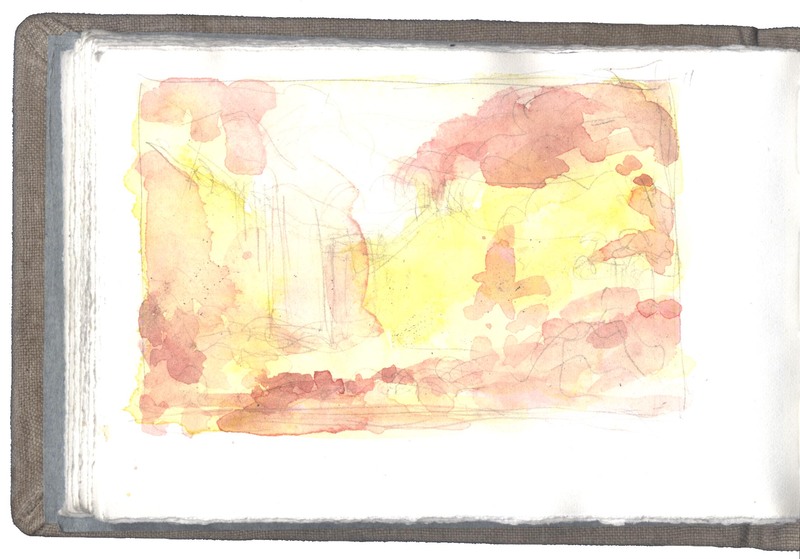 (above) First state showing first washes of yellow overlaid with washes of red. Copy after J.M.W. 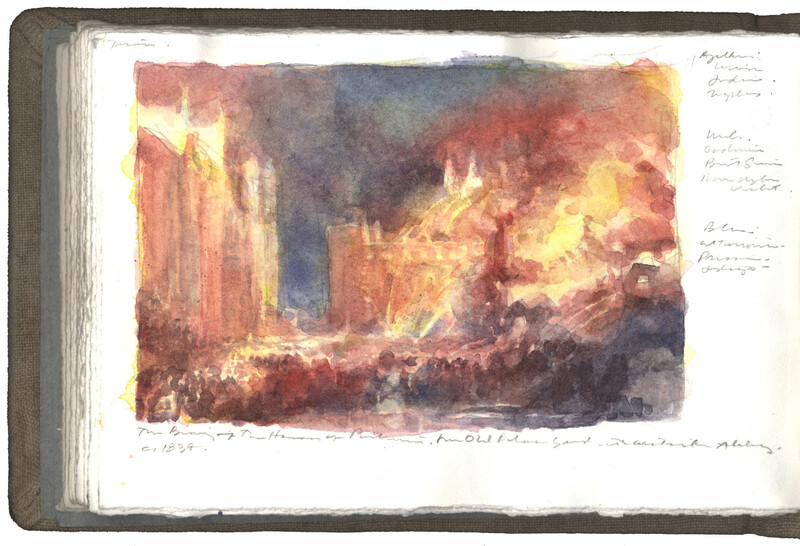 Turner from a reproduction of the watercolor The Burning of the Houses of Parliament, from Old Palace Yard, with Westminster Abbey, watercolor and graphite on Arches paper in bound volume. Link to an image of the original watercolor in the collection of the Tate Gallery, London.